Hello from London! I’ve just finished my summer in Beijing, submitted my dissertation, and have started my fall internship with JPMorgan Asset Management in their Alternatives, Global Transportation Group. After this internship, I head to Latin America to TA Dartmouth’s economic class on their trip to Santiago and Buenos Aires. Future internships in the African and South American regions are in the works. In this blog, I’ll discuss my dissertation topic on the relationship between capital controls and FDI inflows. Then, I’ll mention highlights from my Central Europe, Portugal/Spain travels, and my life in China. Unfortunately since I’ve neglected to uptake this blog, this particular post is a bit long – feel free to skip to parts that interest you most. Malaysia’s implementation of capital controls following the Asian Financial Crisis led to lower foreign direct investment (FDI) levels as compared to what it would have received under an IMF stabilization program. ​Evidence suggests that Malaysia’s implementation of capital controls in September 1998 led to a quicker short-term economic recovery as compared to recovery under an IMF program. With hindsight, I now analyze the longer-term impact of Malaysia’s capital controls on future foreign direct investment (FDI) inflows. Results from a time-shifted difference-in-differences model reveal that Malaysia’s policy mix likely had a negative effect on longer-term FDI inflows​. This negative relationship could be influenced by internal factors, such as signaling of an unstable institutional environment, or external factors such as other attractive investment destinations in the region. This study has implications for future policy recommendations regarding capital account liberalization in developing countries. The effect of capital controls on FDI is relevant for developing countries, because FDI has strong economic development links, and developing countries tend to be more dependent on FDI and external financing flows. FDI provides benefits for economic development such as augmenting domestic savings, providing foreign exchange to offset the balance of trade deficit, raising technological and efficiency standards and improving export performance (UNCTAD 1998). Because FDI is crucial for many developing countries, policies that might jeopardize these future inflows, such as capital controls, must be carefully considered before being deployed. Existing literature on the capital controls-FDI relationship is quite scarce and empirical results are inconsistent. Many empirical studies support the standard hypothesis that capital controls should decrease FDI by increasing the cost of capital movement or signaling an unstable institutional environment (Asiedu 2002, Morrisset 2000, Noorbakhsh, Paloni and Yousseff 2001). 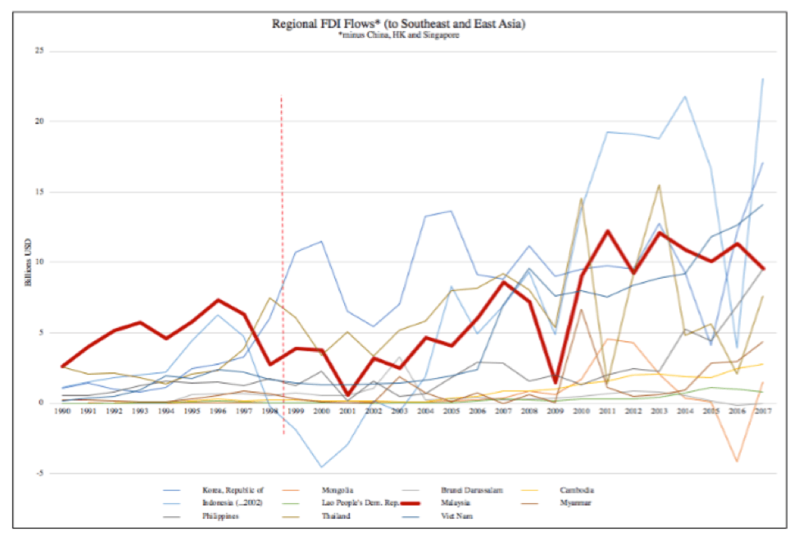 Other evidence suggests that the implementation of capital controls might positively affect FDI or has no relationship at all (Montiel and Reinhart 1999, Carlson and Hernandez 2002). This inconsistency in empirical evidence reveals the difficulty in isolating the effect of capital controls. 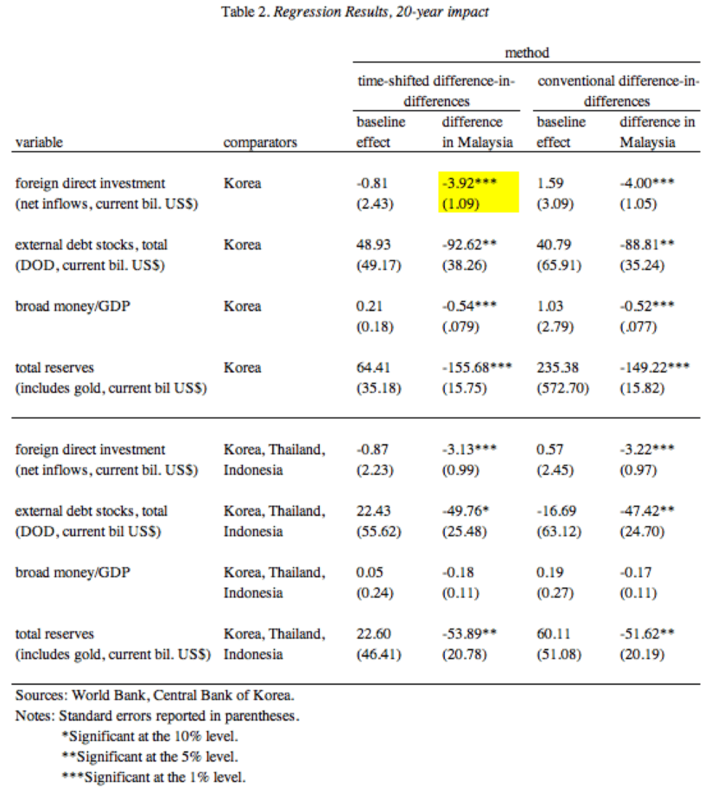 To isolate the effect of Malaysia’s capital controls on FDI, I use Rodrik and Kaplan (2001)’s time-shifted difference-in-differences model and substitute in FDI data. Results suggest that Malaysia’s implementation of capital controls led to a lower level of FDI than it would have received by submitting to an IMF stabilization program. Results are negative and statistically significant at the 1% level. After using robustness checks to confirm the results, I then discuss possible reasons for this negative relationship. First, I argue that Malaysia’s internal policy choice likely deterred investment by signaling an unstable institutional environment. Because capital controls were not considered an appropriate policy response by the international financial community at the time, adoption of the restrictive policy might have served as a red flag to conventional investors (Bhagwati 1998). Second, I use regional FDI data to argue that external factors, such as the relative attractiveness of neighboring countries, might have diverted FDI away from Malaysia. As the debate on capital controls continues to garner interest and there is increasing acceptance of the precautionary role that capital controls can play, additional research is needed to analyze the short- and long-term effects of this policy choice. Though capital controls can help an economy mitigate against unstable short-term capital flows, they might also jeopardize future access to foreign direct investment. The fact that capital controls can induce different short- and long-term effects on an economy underscores the idea that there is no one-size-fits-all policy recommendation in regards to developing countries’ capital account liberalization. In May, I took a weeklong trip to explore Central Europe. I started in Budapest with my friend Teddy, visiting the House of Terror Museum, swimming in the thermal baths, watching the Hungarian National Ballet, and hiking up to the Citadel for a stunning sunset. We loved exploring the ruin bars and attending a concert at the Liszt Ferenc Academy. I then took a bus to Vienna and right when I arrived, I ran to my hostel, threw on a dress and ran to the opera to see Giuseppe Verdi’s Simon Bocconegra. The next day, I bought a cheap standing ticket to watch a piano concert in Vienna Concert Hall’s Golden Room. The Musikverein absolutely took my breath away because of its grandeur with its golden embellishments and Greek statues, and it remains my favorite concert hall that I’ve visited. In addition to the music, I absolutely love the history of the city, and could only imagine the likes of Mozart, Beethoven, Hitler, Freud, Stalien, Tito… living in that very city I was visiting. My final destination was Prague. I took a walking tour of the city, learning about Bohemia, Austria Hungary and the city’s communist past and also visited the Jewish museum and the castle. However my favorite experience was attending a concert at the Rudolfinum for Prague’s 73rd spring music festival! These tickets had been sold out since December, but I arrived an hour early in my dress and waited for someone to return a ticket. 30 minutes before the show a Czech lady came by to drop off an unused ticket, and I ended up sitting by her and enjoying the world-class musicians. After I completed my finals, I took 20 days to explore Portugal and Spain. My friend Avery flew out from Boston to meet me for our Portugal trip. We started in Lisbon for a day, walking around the city. We then went to Porto, where we ran into another Dartmouth alum and ended up joining his family and taking a port wine tour! A highlight was going for a morning run along the river, with the sloping mountains surrounding us. In Lagos, Avery and I went kayaking through the grottos and hiked up to the highest point. We took a bus to Sagres, the southernmost point in Europe, where explorers believed it to be the end of the world. Much of the Age of Discovery expeditions left from this point. We ended up in Lisbon, visiting the Belem monastery and trying their famous egg tarts. I then flew to Spain to join my Dad and brother, Alexander, for a road trip in Spain. We started in Madrid, visiting the Naval Museum Reina Sofia and the Prado. We visited the Cathedral of St. Mary in Toledo, ate tapas and visited Mezquita Cathedral in Cordoba, and watched flamenco and visited Cristopher Columbus’s burial spot in Sevilla. We then drove south to Rota and visited the Rock of Gibraltar and took a day trip to Tangiers. We visited the Alhambra and Chapel Royal in Granada and the Picasso museum in Malaga. The trip ended in Barcelona, where we took the Montjuic cable car up to the highest point of the city and listened to a piano recital in the Palau de la Musica Catalana. This summer, I wrote my dissertation and took language classes in Beijing. Because I had a lot of study/research to do, my summer was fairly routine. The mornings consisted of Chinese class, and afternoons were spent in the library doing research for my dissertation. But the week after my dissertation was submitted, I ventured back out into the city and revisited some of my favorite spots! 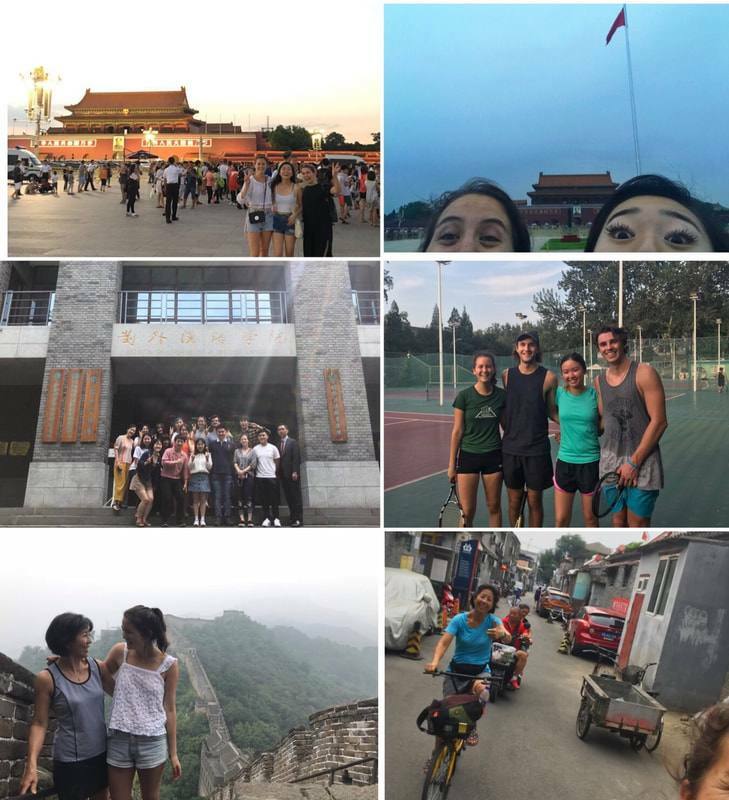 I loved showing friends around and sharing experiences such as sunsets/sunrises at Tiananmen and biking around the hutongs (alleyways) of old Beijing. Wandering around the crazy markets (fried crickets, delicious!! ), biking alongside gridlocked highways and bargaining with local shopkeepers were all part of the experience. Being back in the city for a second time really helped me start to feel more like a local! Photos: sunset flag-lowering ceremony in Tiananmen; sunrise flag-raising ceremony in Tiananmen; class photo at Peking University; tennis on the PKU plastic courts; Great Wall; biking through the hutongs of old Beijing. As I reflect on my past year, I couldn’t be more grateful for the opportunity the Rotary Club has granted me to deepen my expertise in the field of economic development and to learn about other cultures through travel. With the money I’ve saved from my internship, I plan to fund this next 6 months in Africa and South America and intern with firms embedded in the local economies. Thank you again, for your continued support. 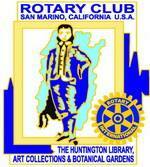 I hope to make San Marino Rotary and Rotary International proud, and will continue to represent our clubs to the best of my ability.